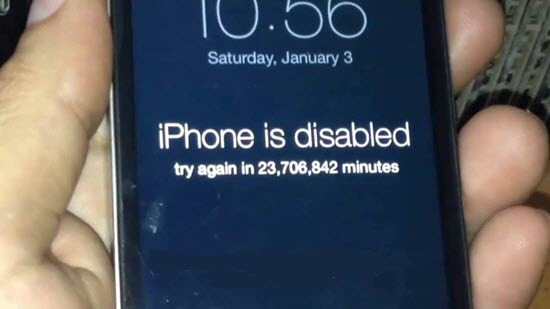 You may get the message ‘The iPhone is disabled’ on the screen, or sometimes you may also see that ‘try again between 1 minute to 5 minutes’ due to unauthorized attempts to access the locked iPhone. The unauthorized attempts may be done by you when you forget your passcode, or any other person who try to access your data. If you have set the layer of passcode on your iPhone, the mentioned issue is the Apple device getting locked due to security measures. Yet such result may not please you since you totally have no idea of your passcode, and you need to unlock your iPhone or you will lost all you data especially if you don’t have any backup. There fore in such cases, we are providing you with a few ways to unlock your iPhone 4/4s/5s/5c/6s/7/8/X/XR/Xs with/without iTunes or Computer. Bounus Tips: If you want to save important iPhone data like contacts, messages, notes and so on, you can always use Jihosoft iPhone Data Recovery to recover/extract data from your iPhone or old iPhone backups before restoring. Generally to unolck a disabled/locked iPhone, you will need iTunes, But there’re cases that the iTunes can’t detect your iPhone or you just don’t have iTunes available. In such cases, there’re still ways to unlock your iPhone; and in this part, we will talk about how to use iCloud to unlock your iPhone. Use a different device like computer to access iCloud.com. Sign in with your Apple Id of the locked iPhone. Tap on ‘Find iPhone’ > ‘All Devices’ > ‘[Your iPhone’s name]’ and you will get to see your device. After this process is done, all your content including your passcode will be removed from the device, and then you can freely access to your iPhone again. When you follow this method, you will receive a data-erasing warning when you click on the “Erase” button provided by the iCloud Find iPhone feature, which mean you will completely lose all the current data from your locked iPhone, unless you have a backup in advance. So before proceeding this process, make sure that you have a backup with iTunes or iCloud. You can also use Siri to unlock your disabled iPhone, another useful method without using iTunes or computers. This solution is actually considered as a bug of the iOS 8 to iOS 11. To use this process just follow the following steps. 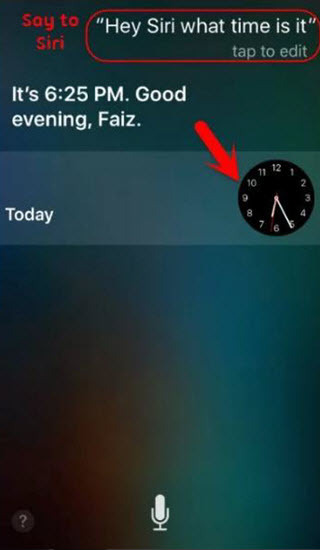 Press and hold the Home button to launch Siri and use any command to make it show you the time or open the clock. After it gives the answer, just tap on the Clock icon it shown in the dialogue. Afterwards you will be guided to the Clock app, then click on Alarms to add a new one. Select the tune sction to pick a song, then just press the Home button to quit. Then you will be back to the home screen and the iPhone is already unlocked. You may also try other commands with Siri, like opening the Calendars app or the Contacts app. After Siri works as you says, you can soon unlock your locked iPhone easily without the passcode. And following this way, you will not need to restore your iPhone, which avoid losing data easpecially when you don’t have any backup. After your iPhone gets disabled or locked, basically, you need to connect the iPhone or iPad to the previously authoirzed computer and then go through iTunes to unlock the device. This process will wipe out the data present in the iPhone entirely, so you’d better have a backup on iTunes or iCloud for later restoring. This is most useful method to unlock your iPhone, though it also has disavantage. First, you need to connect your iPhone to your PC using the USB cable. Now open iTunes and click on iPhone icon in the upper left side of the iTunes window. 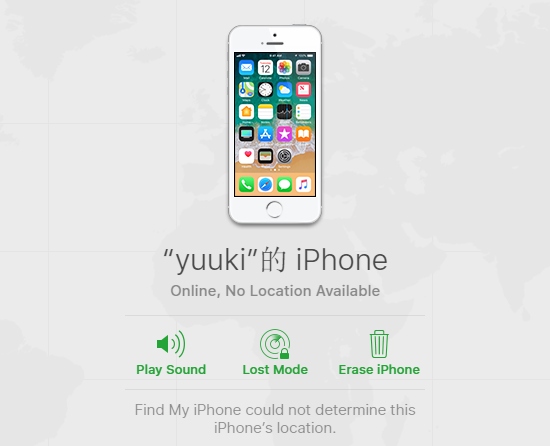 Now click on ‘Restore iPhone’, if the Find my iPhone is turned on in the device then it will prompt you to turn it off to proceed with the steps. Click on the ‘Restore’ button on the next pop up window, then the factory hard reset will restore your iPhone into the original state. You may also need to enter a password before doing so. Now you need to wait for a few minutes for the factory reset of the iPhone to be completed. Once it’s done the passcode will get disabled and the phone will return to its initial stage. If you are having any backup of your iPhone in iTunes or iCloud then you can restore them to your device. Note: Remember to backup before using this method or else you can lose your data, and there will be no way to restore into previous condition. If you have tourble on connecting device with iTunes, like it requires your passcode to get futher, you then need to rely on the first two methods above. We have listed a few best ways to unlock your iPhone without a passcode. These processes might help you unlock the iOS device from iPhone 4/4S/5S to 7/8/X, even including the latest iPhone XR/XS series. You can choose the best and preferable one accordingly to better suit your condition. If you have any question or suggestion, welcome to share your idea below; or share this article with friends and other iPhone buddies to help them with these important methods.